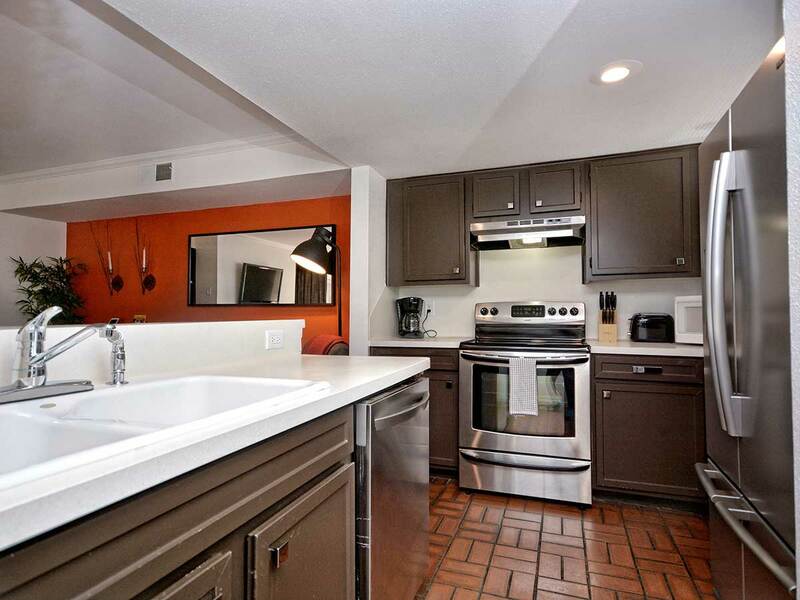 The Metropolitan Suite is one of the many gems located in Austin’s Railyard Condominiums. 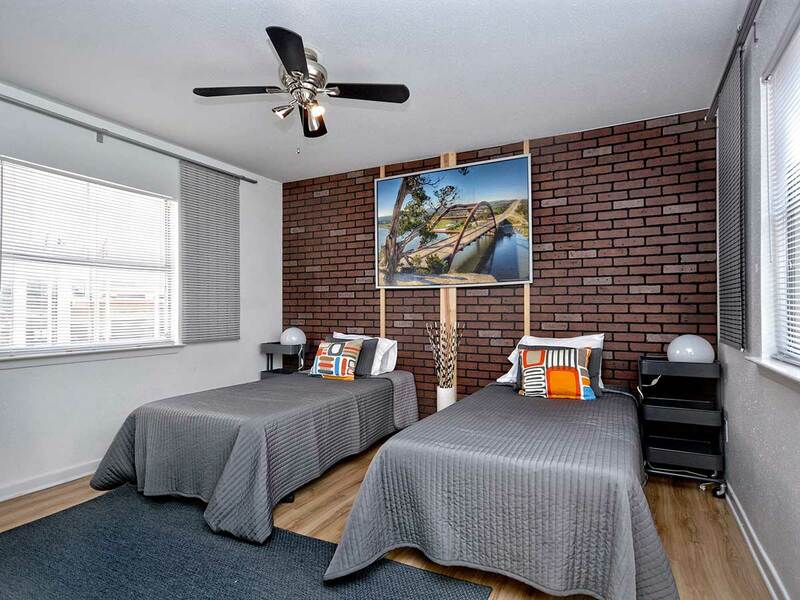 This 2BR, 2BA unit (sleeps 6) boasts cascading brick walls, shining hardwood floors, and modern touches everywhere you look. Lady Bird Lake, the Convention Center, and the boutiques of 2nd street are blocks away from this elegant downtown dwelling. Everything is at your doorstep. However, if you want to stay in, you can have it all delivered. You will receive one reserved parking space in our private and gated complex. 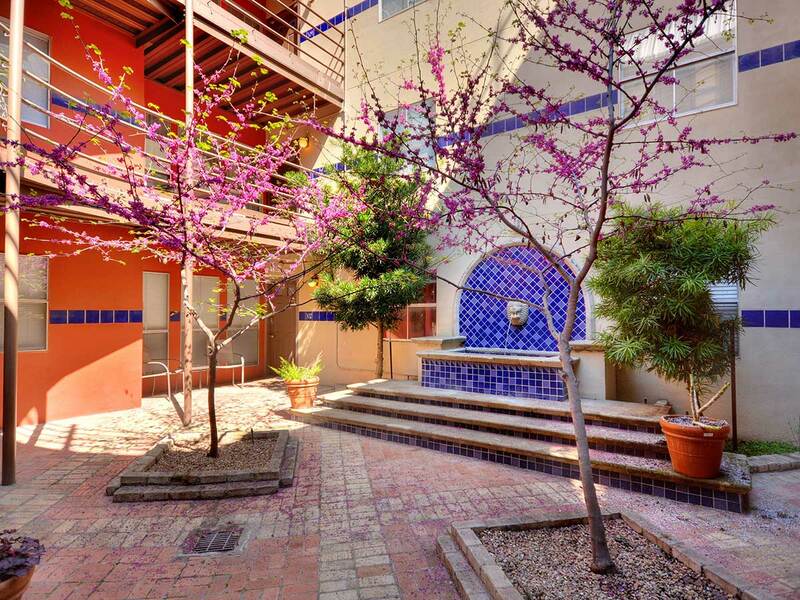 Your parking spot is just a short walk to your 2nd floor condo, which sits above a gorgeous landscaped courtyard complete with a fountain. A patio table and chair set offers a place for outdoor relaxation right outside of your door.Step inside to the tile-floored living room and take in the condo’s clean, modern decor. A queen-size sleeper sofa and armchair offers plenty of comfy seating across from a big flat-screen TV with cable and a decorative fireplace. Large windows let in plenty of sunlight, and the condo’s accents and artwork are the epitome of sleek style. 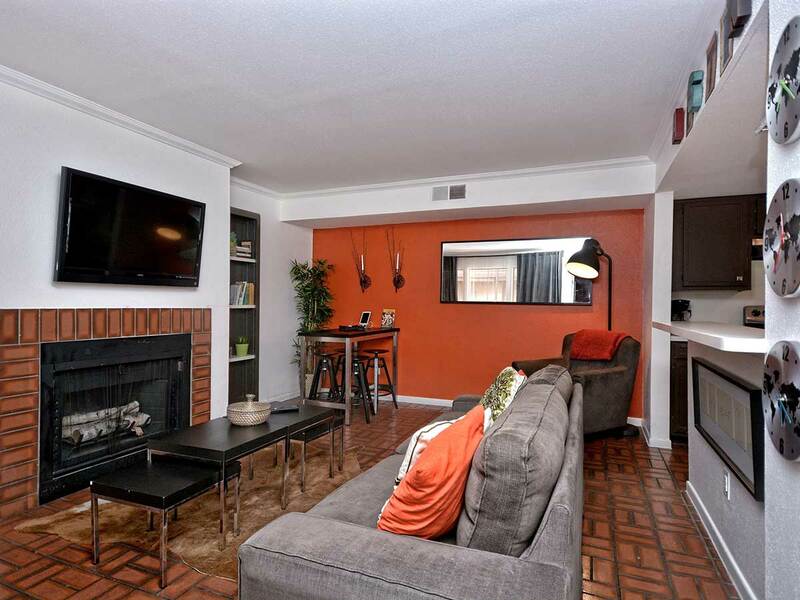 Straight ahead from the living room is a dining area with stool seating for 4 against a burnt orange accent wall. To the left is the gorgeous gourmet kitchen, detailed with a stainless steel double door fridge, an electric stove/oven, dishwasher, and all the stemware, crockery, and counter space a Southern chef could ask for. 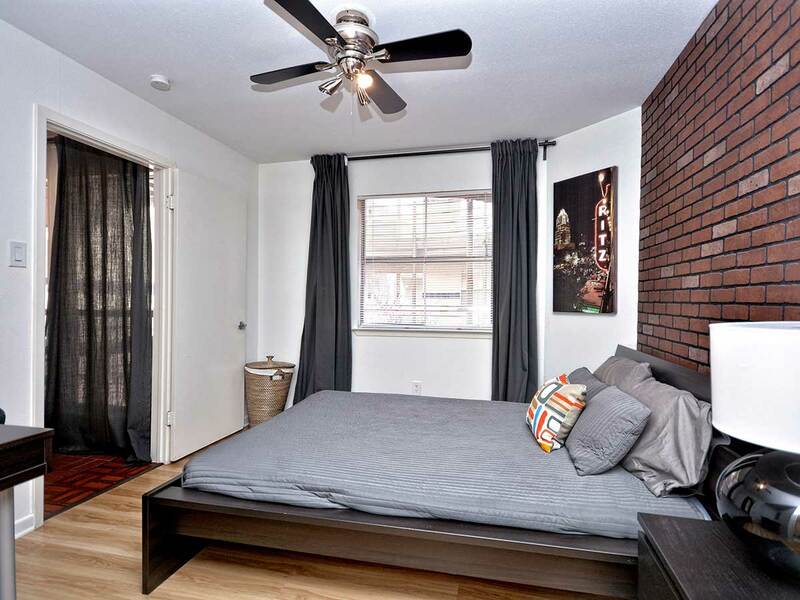 The master bedroom invites you in with an exposed brick wall, lots of natural light, and a heavenly queen-sized bed. An en-suite bathroom offers privacy and convenience with a stand-up shower, single-sink vanity, and a large mirror. The eye-catching redbrick aesthetic continues in the guest bedroom, where 2 twin beds sit across from 2 large mirrored closets. 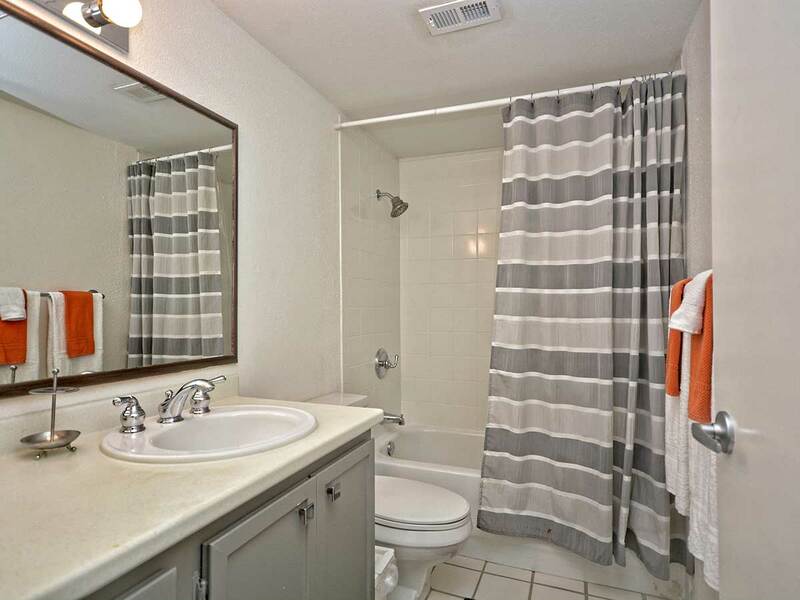 There’s a shower/tub combo and a massive mirror in the bright guest bath.